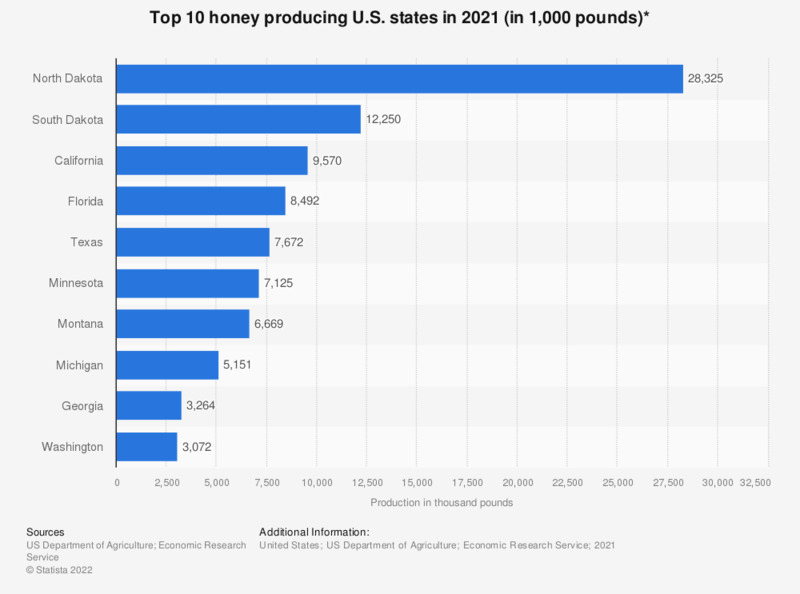 This statistic shows the ten U.S. states where the highest amount of honey was produced in 2017. According to the report, North Dakota produced approximately 33.67 million pounds of honey that year. The use of honey can be traced back to ancient times, with eight thousand year-old cave paintings depicting humans harvesting wild honey. Recorded history shows that honey has been used as part of foods and drinks, as medicine and as part of sacred rituals by many cultures around the world. In modern times, honey is still sometimes collected from wild bee colonies, but most of the worldwide production comes from domesticated beehives. The leading five worldwide producers alone, China, Turkey, Argentina, Ukraine and the United States, harvest annually a combined 1.2 million metric tons of natural honey. The yearly per capita honey consumption in the United States ranges between 0.9 and 1.3 kilograms of honey. Other countries where honey consumption per capita per year exceeds one kilogram are Austria, Germany and Switzerland. In 2015, the estimated deliveries of pure honey for domestic food and beverage use in the United States amounted to approximately 202 short tons. In 2014, the total amount of honey produced in the country was an estimated 178 million pounds. The United States are a major exporter of honey towards countries such as Japan, Yemen or Canada. It also imports honey from all over the world, including Canada, India or Vietnam. Argentina is however the largest importer of honey to the United States, with over 44 thousand metric tons delivered in 2013 alone. As of 2014, the value of the honey industry in the United States was estimated at some 385 million U.S. dollars. * For producers with 5 or more colonies. Colonies which produced honey in more than one State were counted in each State.